Happy St. Patrick's Day! I hope that it is a lovely day where you are. We are promised temperatures in the 60's and that will be great. 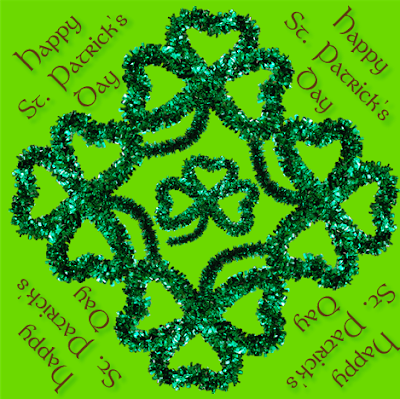 We don't have any special plans for celebrating - no green beer or corned beef and cabbage. 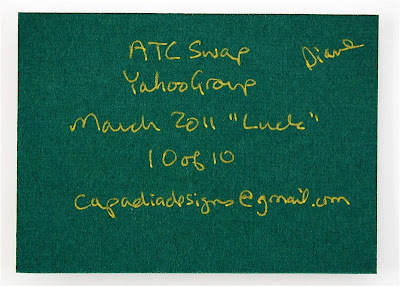 I did participate in an ATC (artist trading card) swap this month. The theme was "Luck" and I went with a pretty simple idea. I have been challenging myself to use some of the Cricut cartridges that I "had to have" and that have remained unused or underused. 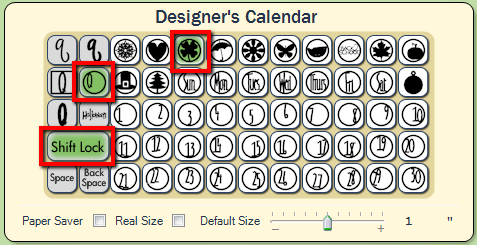 I remembered the holiday symbols on Designer's Calendar and knew there would be a suitable "lucky" image. 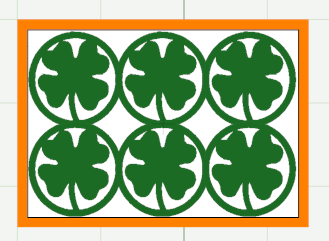 Here is the shamrock in a circle that I used to create the topper for my ATC. 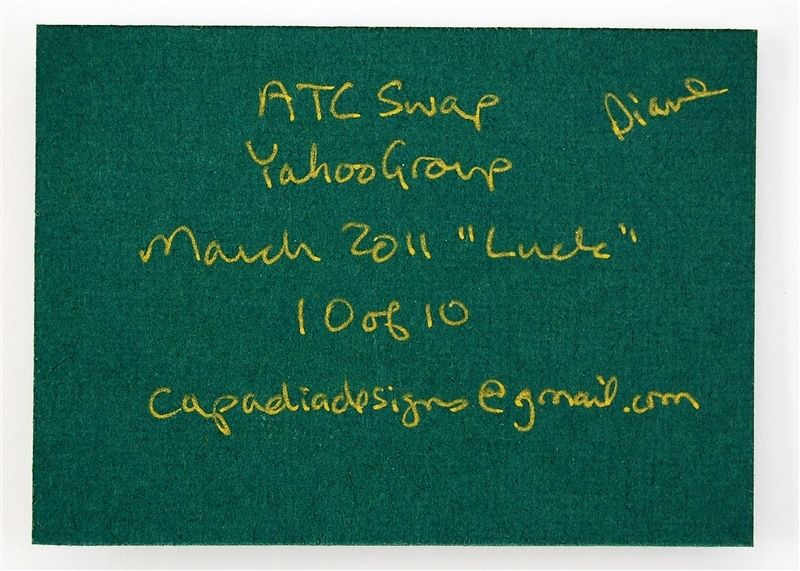 The one rule for ATCs is that they must be 2.5 x 3.5 inches - the rest is up to you! My first idea looked good in the computer (!) but was unrealistically small. I cut some of these but the details were not very clear so I went back and tried with only six images instead of 15 in my grid. 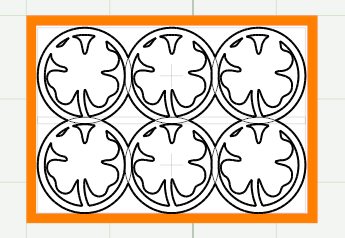 These shamrocks are much more recognizable when cut. The white and orange layers are simply guidelines I used to show the size of the card and a layer at 2.25 x 3.25 inches. The colors are for contrast to help me see how things fit together. The preview here is in color - before cutting I welded the shapes together so they would cut as a unit. When items are welded the cutting lines are bold and the welded areas a paler gray. 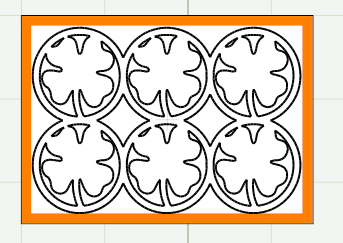 This screen shot shows how the welds appear on the cutting page (the page where the images are on the mat). If you look at the preview on another blank page it is easier to see the cut clearly and to determine if the welds are working as you expected them to work. 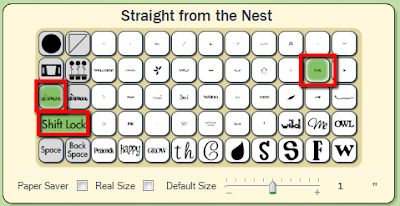 I added the word "Lucky" from the Straight from the Nest cartridge. This is a cartridge I use a lot but I had forgotten about some of the word art. 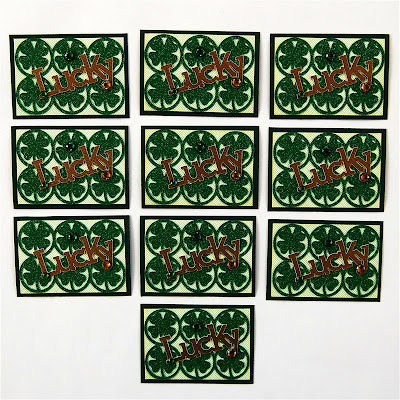 The "Lucky" is actually a layer for the "Lucky Duck" word art. I cut the dark green bases from Bazzill cardstock. The slightly smaller layer is a pale green basketweave pattern from a Martha Stewart stack. The shamrocks are cut from Core'dinations Core Couture glitter cardstock. 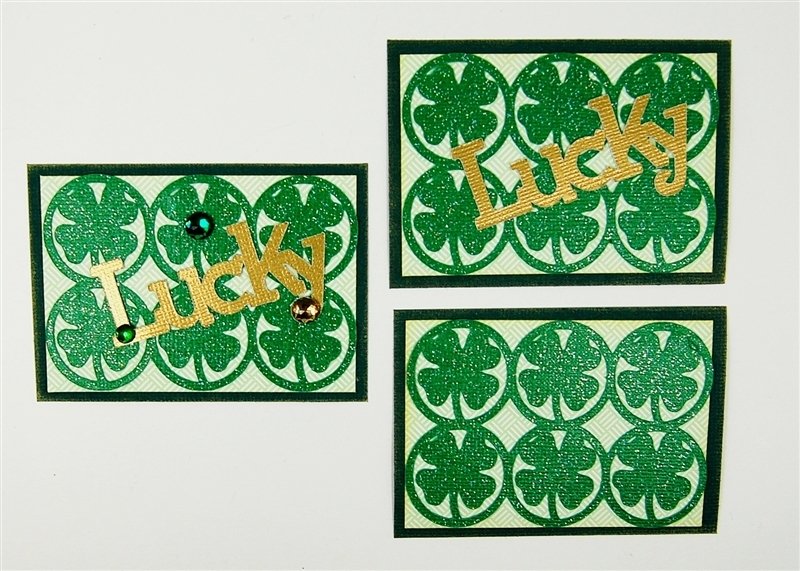 I used a multicut (2 times) on the glitter cardstock to make sure the details would cut cleanly. 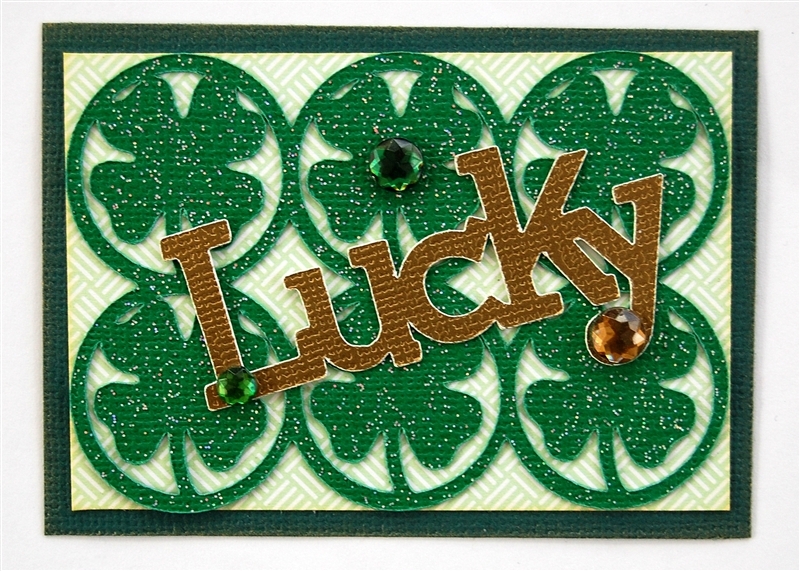 "Lucky" is cut from DCWV metallic gold cardstock. 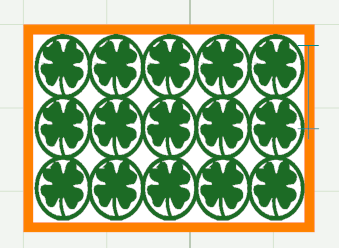 I added some random gems in two shades of green and gold to accent the word and one shamrock. I often do the backs of my ATCs with a digital design, however, this time I simply hand wrote the information with a gold pen. Here are all ten ATCs just before I mailed them away for swapping. Here is another close view so you can see the pattern in the light green paper. The basketweave seemed a bit "Celtic" to me. I inked the edges of the card and the layer with gold ink (hard to see in this photo). 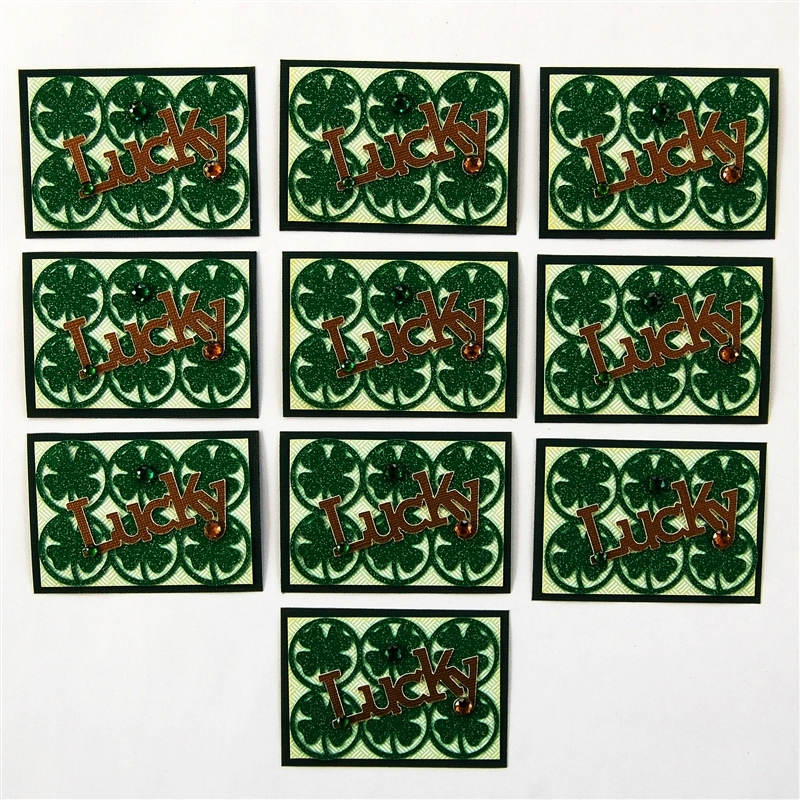 Creative Charms is having a sale to celebrate St. Patrick's Day - until midnight on the 17th (Eastern Daylight Time) you can use the code LUCKY17 to save 17% on any order. 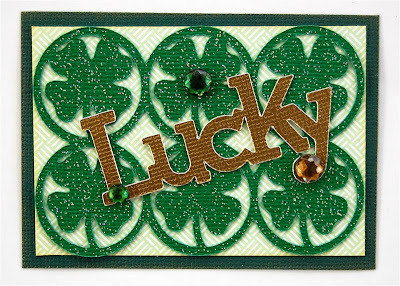 You can also have a chance to win a packet of green goodies from Creative Charms - just leave a comment on their blog - here is a LINK to the post. The more comments that are left on that post - the more packets of goodies that they will give away - sounds like fun! 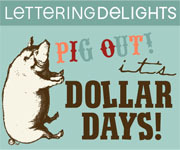 The Lettering Delights Dollar Days sale is continuing and they have a special Lucky Irish Bundle that is free for today only. You can visit the Lettering Delights site by clicking my affiliate link in the left side column or the image below. Early Bird savings from March 15-March 23rd. Save 10% on $15 purchase or more with code: InBloom. Save 25% on $35 with code: BiggerBloom. Finally - you'll want to check out the Green Wednesday specials at Cricut.com - here is a LINK. There are cartridges for sale for $39.19 and under - including Imagine cartridges. Lite cartridges for $27.99. Cricut Circle members get an additional discount and double reward points. I hope you have fun celebrating today - remember to wear something green so you don't get pinched! So cute! You did a great job! I think it makes for a great personal touch handwriting your info on the back. it certainly gives off that Lucky vibe, Diane. You caught the feeling well. This is a great project TFS. Everyone will be LUCKY to get one of your cards! Very cute design.